Now with AutoCAD® 2017 support! Download CAD Markup 2017 (français) now! CAD Markup 2017 (français) adds CAD markup and PDF markup capabilities to CAD Viewer 2017. 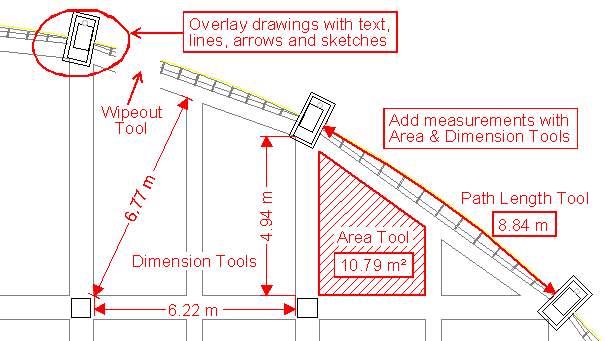 CAD and PDF drawings may be overlaid with text notes and other red-lining elements such as lines, boxes, circles, arrows, dimensions and area calculations, as well as images, and a user defined 'checked' stamp. The drawing along with corrections or highlighted areas may be printed, saved to a PDF document, or saved to a raster image format. The source drawing remains untouched by the markup operations. ComparerCAD Viewer / CAD Markup / SymbolCAD /CAD AQ here.